“Iron road” makes climbing more accessible and takes you to amazing exposed places usually reserved just for mountain goats, climbers or alpinists. Variety of the routes and their difficulties makes this activity suitable for experienced mountaineers as well as families and beginners. In our courses you will safely learn how to use the equipment and explore the magnificent world of via ferrata climbing. Half day course will teach you all the basics you need to start with your independent explorations of via ferrata routes – getting to know the gear, using it safely and choosing the right difficulty. The course is set in the magnificent surroundings of Mojstrana just at the entrance to the glacier valley of Vrata. Most of the course is practical, so you will be learning while climbing some great via ferrata routes with your guide. Learning the basics in a great environment just at the entrance of Vrata valley, getting to know the gear and climbing techniques while climbing some simpler routes with your guide on the first day than doing a serious via ferrata climb in the heart of the mountains around Vršič mt.pass on the second day. A two day course will offer a great introductory to your independent via ferrata explorations in two very different surroundings. 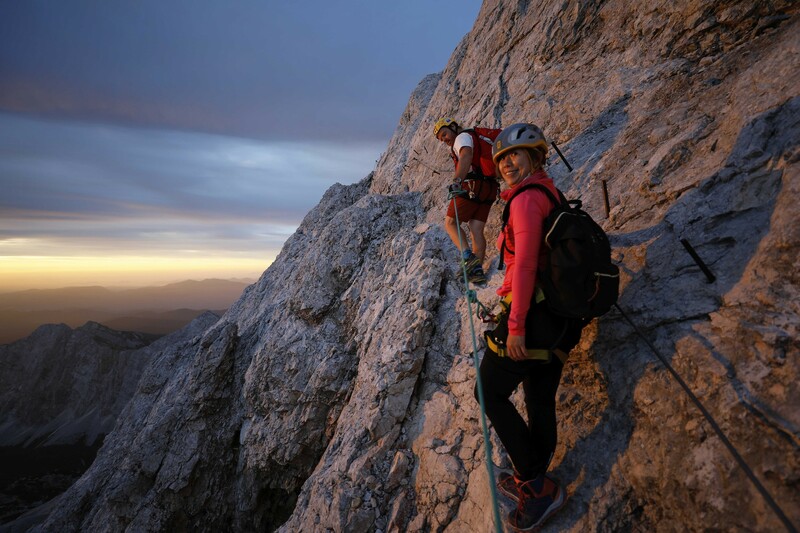 From learning the basics to climbing the magnificent North wall of Triglav in just 3 days.